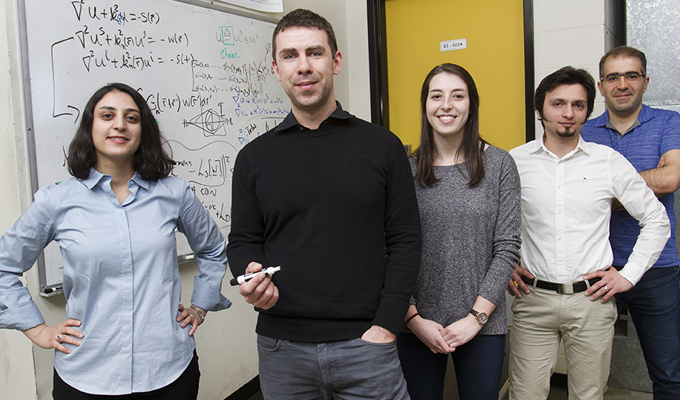 U of M research team members, from left: Forouz Mahdinezhad, Kevin Brown, Joe LoVetri, Nasim Abdollahi, Max Hughson, Nicholas Geddert. The numbers on the whiteboard tell an interesting tale, even if they can only be understood by a few. Scrawled in seemingly haphazard fashion, the equations represent the calculations of a research team that is working to unravel a mathematical mystery that has baffled scientists around the globe. Solve the problem, and the team, led by Joe LoVetri, a professor in the University of Manitoba's Department of Electrical and Computer Engineering, will have achieved something truly remarkable. It will have figured out how to harness microwaves to create a new diagnostic imaging tool, one that could revolutionize the way we detect and treat a range of diseases, most notably breast cancer. Such a device, says LoVetri, would be as useful as an X-ray or a CT scan in diagnosing and monitoring tumours, but at a fraction of the cost and without the potential safety risk of the other machines. "I think we are pretty close," says LoVetri, who has been working on the project for more than a decade. "We might have a trial within the next year," he says, in reference to a potential test run of the new tool involving one or more patients. 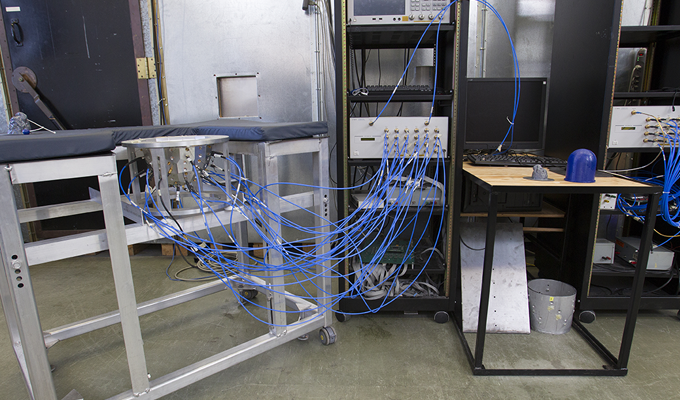 A prototype of a "resonant chamber" used to harness microwaves (left) is wired to a transmitter/receiver. The potential of the work being done by LoVetri and his team has not gone unnoticed in terms of financial support. The professor recently received about $400,000 each from the Canadian Foundation for Innovation and Research Manitoba. Other funding during the past few years - on the order of a few million dollars - has come from other federal funding agencies, as well as from a small Winnipeg-based custom technology development firm called 151 Research. The notion that microwaves could be used for medical imaging has been around for a while. The problem is that while electromagnetic microwave energy has long been used in numerous applications, from microwave ovens to cellphones, no one has been able to figure out how to turn microwave signals that are sent through a body into an image that is suitable for medical use. LoVetri and his team are poised to change that. To that end, they have already built a prototype of a device and have tested it on imitation tissue models. But they still have to figure out how to improve the accuracy and resolution of images produced from microwaves. That's where all those complex calculations on the whiteboard come into play. They are among his team's latest efforts to refine an algorithm - a mathematical process used in computer software - to turn data gathered by beams of electromagnetic microwave energy into an accurate high-resolution image of human tissue. As part of that effort, the team is currently attempting to create an image of a "phantom" breast that features liquids and gel-like solids mimicking the tissues found in a real one: fat, skin, fibro-glandular material, cysts and, most importantly, tumours. "The best way to explain what we're doing is to compare it to computed tomography (CT scan)," says LoVetri. That technology uses a narrow beam of ionizing radiation to gather data - "a bunch of numbers, basically" regarding its movement through an object - and translate this information into an image. A Nobel Prize-winning innovation in the 1970s, CT-scans changed medicine by allowing physicians to get a cross-sectional view inside the body, greatly improving their ability to see the various tissues, and identify tumours. "That has revolutionized medical imaging, because before computed tomography you'd have a grayscale "shadow" picture (X-ray) of the interior of a body, and you'd know that certain shades correspond to different kinds of tissues located somewhere within the body," he says. But while imaging technologies such as X-ray, ultrasound, magnetic resonance imaging (MRI), and positronic emission tomography (PET scan) have improved our ability to detect injuries and illness, they also come with limitations and potential health risks. Professor Ian Jeffrey (second from left) with students Forouz Mahdinezhad (left), Hannah Fogel, Mohammad Asefi, Pedram Mojabi. LoVetri says the best diagnostic tools available today for diagnosing cancer - PET scans, MRIs and CTs - are in short supply because of their cost. Each one of these machines can cost between $1 million and $10 million, a factor that contributes to longer wait times. A microwave scanner, by comparison, might cost a few hundred thousand dollars and can be made portable. In addition to being cheaper to use, microwaves are also safer. "Microwaves and radio-waves are the same kind of thing, just electromagnetic waves at different frequencies," says LoVetri. "What's going on in a microwave oven is that electromagnetic energy - at a frequency that is the same as that used in your cell phone to transmit and receive information to and from a communications tower - is used to heat your food, and it's not dangerous, unless the power is high." Microwaves shake molecules, which can create heat, so too much exposure can cause a burn. But unlike the ionizing radiation in X-rays, CT-scans, PET scans, and sometimes in the contrast dye used for MRIs, microwaves do not damage DNA, says LoVetri. "You only need a bit of energy from ionizing radiation . . . to break DNA and then it's a statistical probability matter on whether you break, even a single, molecule of DNA in a way that causes a mutation in a cell that turns into a cancer cell," he says. LoVetri first became interested in microwave research in 1997 while he was in the Netherlands on sabbatical from the University of Western Ontario. At the time, he was working on a project to determine how they could be used to detect landmines. "Think of its potential for breast cancer detection and treatment." "Ultimately, I found microwaves a cool thing to study. I can't say I fell into it. I just found it really interesting." Once at the U of M in the early 2000's, he started looking into developing the technology for medical diagnostics. It was a tall order. For decades, other researchers had tried to take what was largely a theoretical concept and translate it into a real-world diagnostic tool. LoVetri envisioned a device that could be used to detect a variety of illnesses, including breast cancer. But he also understood that microwave-based technology could be used to monitor a patient's progress more often during treatment, a move that would lead to better care. For example, a patient who currently receives 12 weeks of chemotherapy for breast cancer does not receive a CT scan during the treatment to determine if it is working because the equipment is too expensive and too scarce for this purpose, not to mention, of course, the additional exposure to harmful radiation. "So what they do now is wait until after the 12 weeks to see if the treatment works, and that means you could have suffered through chemotherapy for 12 weeks only to find out it didn't work," says LoVetri. Or perhaps therapy worked very well, he adds, and the course of treatment could have been shortened, accelerated, or the dose changed. With microwave technology, such patients could be monitored more frequently. Moreover, the technology has a diagnostic advantage because it can be used to discern with certainty the difference between a tumour and other tissue, such as a cyst, which other modalities cannot always do. So, why hasn't this technology been put to use in a health-care setting already? "The problem is microwaves have a very large wavelength, so now when you try to make a transmitter for them, the waves go around molecules, whereas high frequency [shortwaves] like ionized radiation go in direct paths," says LoVetri. This means microwaves create a lot of data noise that must be sorted through mathematically to be meaningful. But doing so is easier said than done. Scientists in the early 1970s understood the principles, says LoVetri, but the math had yet to catch up. "It boiled down to finding an algorithm that could solve what's called a non-linear, ill-posed inverse problem," he says. "With an inverse problem, we know what we send and what we receive, but we don't know what it just went through. Mathematically, it's a much more difficult problem to solve because there can be more than one thing that the wave went through for the same collected data." A student prepares to drop a "phantom breast" into the prototype of the resonant chamber. Eventually, mathematicians found ways of dealing with the problem and created the required algorithms, but only for industrial use. An algorithm for medical use remained elusive. As with other researchers in the field, LoVetri continued to work on the problem, making slow but steady progress. Then he caught a bit of a break, his team noticed an algorithm being used by an oil and gas company for exploring for oil. So in the summer of 2008, Colin Gilmore, one of LoVetri's PhD students at the U of M, took a summer internship at the Schlumberger-Doll Research Center in Boston, where he studied the algorithms they were using to create subsurface images from measured seismic-wave data. The algorithm was later improved and adapted to biomedical imaging applications by other PhD students, including Puyan Mojabi and Ian Jeffrey, who are now both professors at the U of M.
"That got us [the research team] to the point where we could start thinking about building actual systems to collect the data and try it," says LoVetri. 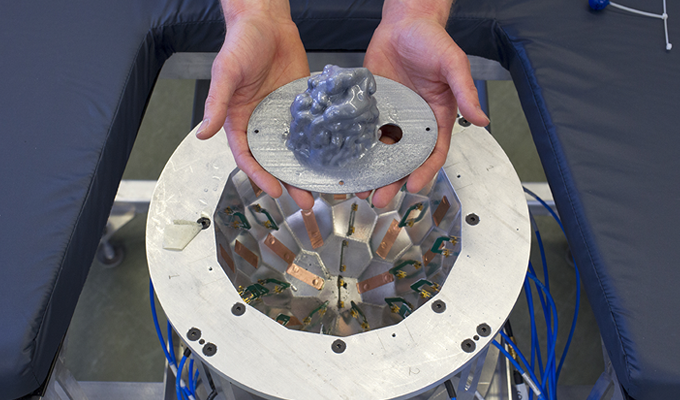 At the heart of all this work is the prototype, a device LoVetri calls a "resonant imaging chamber." Essentially, it consists of a large metallic open-sided chamber that has been dropped into a hole in a table. On the inside of the chamber are a few dozen antennas. They are attached to cables on the outside of the chamber that connect to a microwave transmitter/receiver. "We are the only ones in the world doing this using a resonant chamber," says LoVetri. The idea is that a patient would lie on her stomach and insert her breast into the open end of the chamber. Microwaves would then be transmitted from one antenna and received by all the other antennas in the chamber. "That's the key to microwave diagnostics," says LoVetri. Fat, muscle, fibro-glandular tissues, tumours, and cysts have unique values. "So if you can create an image that tells you, using colour coding, that one part of the picture has a dielectric constant of 60 and the other is five, you know that's a tumour because tumours have a dielectric constant of 60 while a dielectric constant of five is fat," LoVetri says. "So this gives us what is called a quantitative image that is very meaningful." By contrast, an MRI or CT-scan usually provide a non-quantitative grayscale image that requires an experienced radiologist to determine whether a gray shape in an image is a tumour. LoVetri says that making these imaging techniques more quantitative often involves injecting radioactive dyes into tissues to provide contrast between different tissues, "but this is already inherent in the dielectric constant of the tissues." 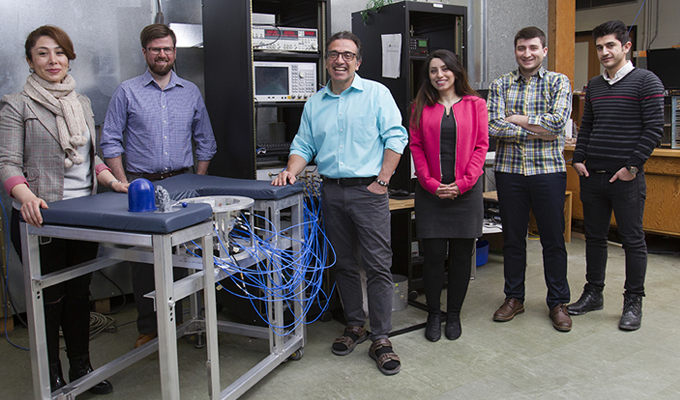 U of M researchers pose with the microwave digital imaging prototype. From left: Nasim Abdollahi, Cameron Kaye, Joe LoVetri, Tamanna Eini Keleshteri, Amir Ghasemi, Vahab Khoshdel. While LoVetri and his team continue working on refining their algorithm, they are also working with a second group of researchers to solve another problem inherent to microwave technology. As he explains, microwaves produce low-resolution images, so while you can see a tumour, you can't decisively determine its geometry and size. Moreover, microwaves alone make it difficult to find early-stage, small tumours, which can easily be missed. To overcome this challenge, the U of M team has recently partnered with University of Calgary researchers to create a dual-mode diagnostic tool using an ultrasound overlay to create higher-resolution images. "Ultrasound is a lot cheaper than MRI, so if we can get the dual-mode ultrasound-microwave technique, all in the same machine, that would be really revolutionary," he says. "No one else is doing that except us, with the help of our colleagues in Calgary." "Ultrasound is a lot cheaper than MRI, so if we can get the dual-mode ultrasound-microwave technique, all in the same machine, that would be really revolutionary." LoVetri says it is important to note that the microwave technology being developed at the U of M can be used in areas other than medicine. For example, 151 Research has licensed the technology to monitor moisture in grain storage bins, where high resolution isn't important but detecting the presence of moisture is. "That company will start generating revenue from grain imaging and that will ultimately help in commercializing the technology for medicine," LoVetri says. In the meantime, work continues on the elusive algorithms and data collection systems that will harness the power of microwaves for use in a health-care setting. "Think of its potential for breast cancer detection and treatment," LoVetri adds. "There's no way you could follow all the women being treated in Winnipeg right now on a weekly basis using MRI, but with microwave technology, we could." Reporting to the Minister of Growth, Enterprise and Trade, Research Manitoba has an annual budget of $12 million and supports researchers working in the fields of health, natural sciences, social sciences, engineering and the humanities.